The K21 next-generation infantry fighting vehicle (NIFV) has been developed for the Republic of Korea (ROK) Army to replace the existing K200 series infantry fighting vehicles. The K21 NIFV has been developed to reinforce the Republic of Korea Army's combat capabilities. The ROK Army plans to launch about 1,000 K21 NIFV units into the field. The South Korean K21 next-generation infantry fighting vehicle (NIFV). The K21 next-generation infantry fighting vehicle (NIFV) has been developed for the Republic of Korea (ROK) Army to replace the existing K200 series infantry fighting vehicles. It is an amphibious vehicle fitted with a turret-mounted 40mm cannon. The vehicle was first developed by Doosan Infracore, a subsidiary of Doosan Corporation. 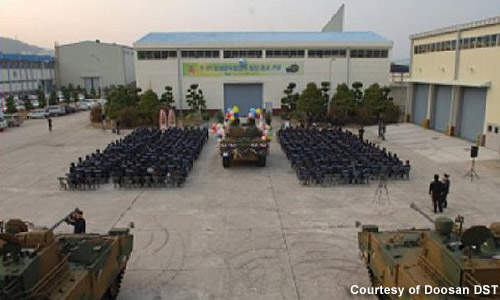 In December 2008, Doosan DST, manufacturer of the K21 NIFV, was formed by spinning off the company’s defence industry business from Doosan Infracore. The vehicle has been designated by the ROK Army as K300 or XK21 KNIFV. In 2003, the ROK Army awarded a contract worth KRW91m (approximately $77,000) to Doosan DST to develop a prototype of the NIFV. 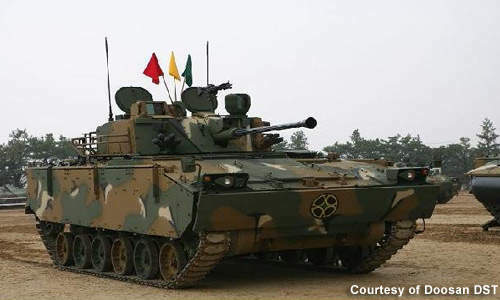 To develop and to release the K21 NIFV into the market, 11 defence equipment suppliers including the Agency for Defense Development and Doosan DST have contributed. 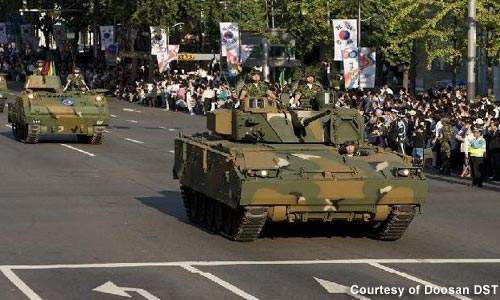 In 2005, Doosan DST delivered three prototypes of the K21 NIFV to the ROK Army. Production began in 2009 after ten years of continuous development. In November 2009, South Korea agreed to supply K21 NIFVs to the Malaysian Army. Doosan DST previously sold 111 Korean NIFVs to the Malaysian Army between 1993 and 1995. In October 2008, Doosan DST signed a phase 1 contract worth 457.8bn won ($386.7m) with the Defence Acquisition Programme Administration (DAPA) of Korea to supply the first batch of K21 armoured vehicles. The vehicles were developed by Korean technology and deployed in November 2009. The contract was sealed due to the design and mechanical flaws found in the vehicles. In December 2009, Doosan signed a $665m Phase 2 contract with DAPA for the supply of K21 armoured vehicles. The problems found in the vehicles were fixed and faulty parts were replaced. Vehicle deployment began in April 2011. Doosan signed a $684m contract with DAPA in December 2012 to supply the third batch of K21 armoured vehicles. Doosan also intends to provide main and supplementary equipments for the vehicles. The vehicle deployment will begin in 2013 and continue through 2016. The K21 NIFV has been developed to reinforce the army’s combat capabilities. The vehicle is 6.9m long, 3.4m wide and 2.6m in height. It weighs 25t excluding the combat loads. The vehicle features composite armour with layers of soft-kill anti-missile defence systems, ceramic and glass fibre providing high levels of protection to the crew. It has seating for three crew and nine soldiers. The suspension of the vehicle is in-arm hydro-pneumatic. It can traverse a range of 450km at an average speed of 70km/h (road) and 6km/h (water). The K21 is equipped with an advanced fire-control system and gun stabilisers. The fire-control system can spot objects from over 6,000m and identify them from over 3,000m. It also has identification friend or foe (IFF) sensors. The IFV commander’s panoramic sight (ICPS) and IFV gunner’s primary sight (IGPS) from Samsung Thales are mounted on the vehicle allowing the vehicle to detect ground and aerial targets. The ICPS has a thermal viewer and a laser rangefinder with the ability to detect targets from 6,000m and identify them at 3,000m. The main armament of the K21 NIFV is a 40mm cannon and two anti-tank guided missile launchers. They are fitted to the two-man turret mounted on the vehicle and the ammunition for the cannon is kept beneath it. The 40mm cannon can fire 300 rounds a minute with a velocity of 1,005m a second. The armour-piercing fin-stabilised discarding sabot (APFSDS) rounds can penetrate up to 220mm of armour because of their ability to self sharpen. The anti-tank guided missiles are third-generation missiles, which can penetrate armour of up to 1,000mm in line with the Israeli Spike missile. The secondary armament of the vehicle is a coaxial 7.62mm machine gun. The vehicle is made up of composite armour consisting of various layers of ceramics, glass fibre and lightweight alloy. The front armour is designed to protect from large-calibre automatic cannon rounds that can penetrate armour up to 50mm at a range of 1,000m. The side armour protects from 14.5mm AP rounds that can penetrate armour up to 25mm from a range of 1,000m. The top portion of the vehicle can withstand attacks from 152mm artillery shells exploding from 10m away. The fuel tank is self sealing and can absorb attack impact, unlike hardened fuel tanks. The K21 NIFV is also fitted with automatic fire suppression system that get activated and extinguishes fire erupted internally. The K21 NIFV product improvement programme (PIP) will have an active protection suite and hard-kill anti-missile system. The system will increase the vehicle’s ability to defend against attacks of anti-tank guided missiles. The passenger compartment has a 15in screen installed to provide data from the blast management system. The external CCD camera mounted to the vehicle also allows the passengers to survey the outside environment. The K21 NIFV runs on a Doosan D2840LXE V-10 turbocharged diesel engine generating 750hp, and has a fully automatic transmission. Under the K21 NIFV PIP, an improved engine with 840hp will be added to the vehicle. It can also accomplish amphibious missions, running on a pontoon system when in water. Hydro jets provide traction in this amphibious mode.